It seems like everyone in Odyssey is looking for something. As Emily pursues her hopes and dreams, she journeys in the Imagination Station to see Whit as a young boy. Penny goes hunting for happiness but her search makes her miserable. And Jay must figure out a strange program in the Room of Consequence that could lead to an unwanted ending. Through his inventions and wise counsel, Whit guides the folks in Odyssey along the right path. 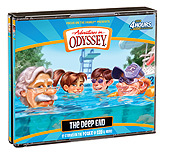 Look for your copy of The Deep End (#55) at your local Christian bookstore and online retailers very soon and keep your Adventures in Odyssey collection current. Of course, you’re more than welcome to discuss Albums 55 and 56 at our new site feature: The Soda Shop Message Boards. And speaking of The Deep End, don’t forget to submit your entry for our third annual ScoopYourself contest. Our deadline is May 18th! Learn more about the contest here. Don’t miss out on this awesome opportunity!